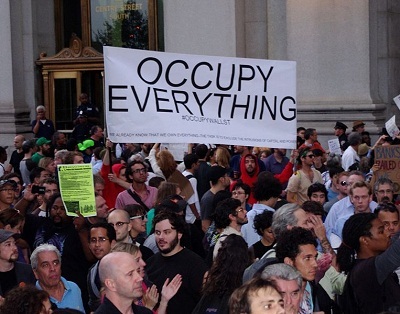 If given the chance, would the people in your organization stage an “Occupy” protest? Do they have feelings of inequity, spawned by the perception that the top 1% in your organization receive a disproportionate amount of the rewards at the expense of the 99%? Unless you’ve lived under a rock for the last few weeks, you’re probably familiar with the “Occupy” movement that has spawned social protests on Wall Street and various cities and venues around the world. Underlying these protests of social and economic inequality, corporate greed, and the influence of money and lobbying in politics, is a profound lack of trust between leaders and those being led. We live in an information age, where just about anything we want to know is but a few keystrokes or mouse-clicks away. Yet in many of our organizations, leaders withhold information as a way to maintain power and authority over others. A lack of information sharing about the compensation system at the Mayo Clinic had created perceptions of inequality and just a 17% satisfaction level in 1999. By increasing the frequency, clarity, and transparency of communication about all compensation related matters, the Mayo Clinic was able to raise the level of satisfaction to 82% in 2011, with very little change to the fundamental structure of the compensation system itself. In the absence of information, your people will make up their own version of the truth. Share information openly so that your people know the facts about what’s going on in the organization and trust that they will use and respond to that information responsibly. My friend, colleague, and organizational change expert Pat Zigarmi, likes to make the point that contrary to popular opinion, people don’t resist organizational change; they resist being controlled. When people are shut out from contributing to decisions that will directly impact them, they develop a sense of distrust and skepticism toward the decision makers. After the terrorist attacks on 9/11, my organization suffered a loss of over $2 million dollars of booked business due to clients eliminating corporate travel. Our company had to make immediate moves to reduce expenses, but rather than making the easy and obvious decision to layoff staff, our leadership engaged everyone across the organization to generate ways to decrease costs or increase revenues in order to avoid layoffs. Hundreds of ideas were surfaced and many were implemented which resulted in the company being able to not only survive the economic downturn, but continue to make a profit and avoid eliminating jobs. Involving your people in making decisions will lead to higher levels of trust and commitment. Remember, those who plan the battle rarely battle the plan. Google is legendary for the perks that it offers its employees. At the Googleplex, Google’s corporate headquarters in Mountain View, CA, team members have unlimited access to free haircuts, massages, meals, dry cleaning, and even on-site medical care. Just like workaholic parents who fool themselves into believing they can make up for their lack of presence in their kids’ lives by spoiling them with all the latest toys and gadgets, leaders often fall prey to the same line of thinking by believing corporate perks and benefits can make up for the lack of intimate one-one-one leadership. Developing genuine and authentic relationships is a primary way to build a culture of trust. Economic inequality is one of the primary platforms of the Occupy protest movement. According to research done by Kevin Murphy at USC’s Marshall School of Business, in 1971 the ratio between the average CEO’s salary and that of an employee was 30.6 percent (averages of $212,230 vs. $6,540). In 2009, the last year of his research, it was 264.4 percent ($8.47 million vs. just over $32,000). Although research has consistently shown that money is usually not a primary motivator for employees, it would be a huge mistake to discount the negative effect of unfair compensation. In a recent HBR blog article, Teresa Amabile and Steve Kramer, authors of The Progress Principle, make three excellent points about the importance of fair compensation. First, compensating your employees fairly is simply the right thing to do. Second, fair compensation creates a more positive “inner work life effect” – the positive flow of emotions, thoughts, and motivators about the employee’s perception of their work. It’s confirmation of Ken Blanchard’s old saying that “people who feel good about themselves produce good results.” And third, compensation is more than a paycheck. It’s a signal to employees about their value to the organization and the importance of the work they do. If we’re willing to pay attention, we can learn several important lessons from the Occupy movement. Sharing information liberally, increasing employee involvement in decision-making, nurturing one-on-one relationships, and compensating people fairly will lead to higher levels of trust, commitment, and engagement in our organizations. Thank you, Dorsey. You make a valuable point about the two-way nature of communication and trust. My personal opinion is that leaders & organizations need to take the first step in extending trust to their people and recognize that they do have a voice, and by listening to that voice they’ll create more engaged and committed followers.